Harriet Amelia Folsom Young was born on August 23, 1838 and is the daughter of William H. Folsom and Zerviah Clark Folsom in Buffalo, New York. They became members of the Mormon Church in 1841 and moved to Nauvoo, Illinois. In 1846 the Mormons were driven out of the State of Illinois so they moved to Keokuk, Iowa and then to Council Bluffs. In 1860 they came West by wagon train to Salt Lake City, Brigham Young the president of the Mormon Church often came out to welcome the wagon trains when they entered Salt Lake City and this is when he met Harriet Amelia Folsom Young . At this time the Mormon Church was practicing polygamy, so after a two+ year courtship Harriet Amelia Folsom became Brigham Young's 25th wife on January 24, 1863. In history she has been depicted as Brigham Young's favorite wife. After the marriage she dropped the Harriet from her name since there were two other wives named Harriet. Stories were told by various wives of Brigham Young stating she and Brigham had their dinners at seperate tables from the rest of the wives and ate delicacies not served to the rest of the wives and children. At Amelia Folsom Youngs funeral, however Richard W. Young son of Brigham Young stated "she had the love of every member of the family." This was echoed by Heber J. Grant who also stating that "Brigham Young's wives loved his young wife." 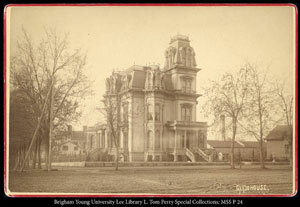 In the later years of Brigham Young's life, he decided build a home on the South West corner of State Street and South Temple, directly south of the Beehive House. He was planning to use this house to receive official callers and entertain dignitaries, when they came to see him. It's was Brighams intent to have Amelia serve as the official hostess at this home. Brigham named the house the Gardo House. The houses designers were Joseph Ridges and William Harrison Folsom, Amelia's father and Father in Law of Brigham Young. Because of this the house became known as "Amelia's Palace". Brigham Young died on December 11, 1877 before the house was completed and thehouse eventually became the home of John Taylor, president of the Mormon Church. Amelia never lived in the Gardo House. She lived the rest of her life in the house nicknamed "Little Gardo", which was located on First West and South Temple. According to all historical accounts and Church records, she never remarried. So how does Amelia belong in the Leavitt Family History? One day in the late 1950s or early 1960 Dean Quincy Leavitt grandson of John Quincy Leavitt was reading the book "The 27th Wife" written by one of Brigham Youngs wives. 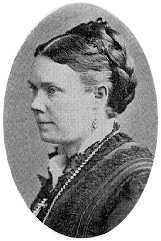 In it she stated that Amelia had married John Quincy Leavitt in the Lion House on August 15, 1878, approximately one year after Brigham Young's death. She references a notice written in the New York Times on August 26, 1878. Dean Quincy Leavitt continued to researce this and verified that the notice was in fact in the New York Time. It was later verified that an article had also been written in the Salt Lake Tribune on August 18, 1878. Dean Quincy Leavitt also asked his Aunt Claire (Hannah Claire Leavitt Wood), the last surviving daugher of John Quincy Leavitt if it was true and she said yes, but the family never talked about it. We will probably never know why John Quincy Leavitt married Amelia Folsom Young since this was a time when the Federal Goverment was cracking down on polygamy. It is inferred in our family history that John Quincy Leavitt knew Brigham Young quite well, so it is possible that he requested John Quincy Leavitt to marry Amelia after his death. It is a very interesting part of our Leavitt Family History and if we hear more we will add it to the story. 1. Utah History to Go, story ot the Gardo House and the Morman Church.